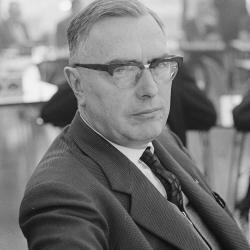 The fifth World Chess Champion in history, Max Euwe was a Grandmaster who was a very logical and knowledgeable player. He was not the strongest World Champion tactically, but he was also not afraid to jump into very complicated variations and calculations in his games. When he had a good position, he could beat anyone in the world. But in worse positions where there was no advantage, Euwe was not the most resourceful and for this reason some players have viewed Euwe as one of the weaker world champions. Euwe studied math in university and earned a PhD by the time he graduated. He won 12 Dutch Championships in his lifetime and this still stands as the record. Because Euwe had a young family, he could only play chess during vacations from school. Once he graduated though, then he was able to devote more time to the game. In 1933, Euwe defeated Alekhine in a match for the World Champion title and this win was seen as a major upset. Alekhine got his rematch in 1937 and won the title back though, so Euwe’s reign as World Champion was short lived. In his chess career, Euwe won 102 tournaments, a number that is impressive considering that Euwe was never a full-time chess player. Max Euwe passed away on November 26, 1981.